July | 2010 | Let Teddy Win! I am in Alaska this week, where needless to say we are unable to attend the rest of the Nationals homestand vs. the Braves and Phillies. As we did in previous summers, we are going to ask the loyal Let Teddy Win readers to take over! Were you at Nationals Park? Please leave a comment on this blog post with your reports describing what happened in the presidents race (be sure to mention the date). Got photos? Add them to the Flickr presidents race group, or on our Facebook page. When we return we’ll update the Presidents Race Standings page with all the results! The Washington Nationals returned to town Tuesday night after a lengthy road trip that was preceded by the traditional All Star break — a two week stretch that represented the longest break of the season between games at Nationals Park. Was Abe Lincoln's grimace too menacing for the kiddies? With the trade deadline looming, it’s the season for surprise moves, and some fans arrived at Nationals Park expecting to see changes by general manager Mike Rizzo before the homestand concludes; but few expected a wholesale makeover of the presidents race roster. Yet there it was on Tuesday night. 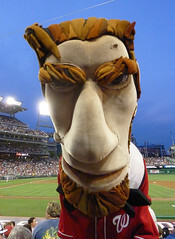 Over the All Star break, every member of the Nationals racing presidents received a facelift. The oversized caricatures of the Rushmores that first appeared in 2006 were gone — now replaced by slightly more cartoonish, smiling figures. Was it a rumored licensing dispute with the designer that led to the change, or did the team simply think Abe Lincoln was just too menacing for the kiddies? Both the originals and the new-look racing presidents were created by Randy Carfagno Productions in New York. No explanation yet from the Nats. Readers – What do you think of the new “botox smile” look? The Washington Nationals wrapped up their homestand and their annual Christmas in July event on Sunday at Nationals Park, with the U.S. Marines Corps Reserves on hand all weekend collecting toys for the Toys for Tots Foundation. 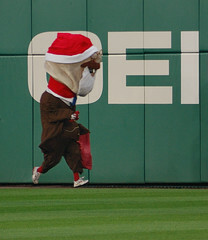 Teddy Roosevelt appeared to have a gift in store for his fans as well, bolting out of the centerfield gate for the 4th inning presidents race, and staking a huge lead while wearing a Santa hat. But Teddy failed to deliver the gift of victory, instead stopping along the first baseline to pass out presents for fans in the stands. He never finished the race. 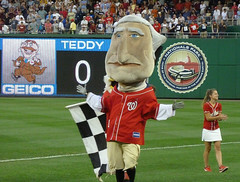 George Washington surprised the field by winning his third race in a row, ensuring that the fellow racing presidents Thomas Jefferson and Abe Lincoln will remain deadlocked atop the Nationals presidents race standings through the All Star break and the road trip that follows. For those crazy enough to follow these things, Thomas Jefferson’s recent surge has created an unusually tight race in the presidents race season standings as the All Star break approaches. Deadlocked at 17 wins apiece, Abe Lincoln and Thomas Jefferson were looking to make a statement as the final series of the homestand got underway Friday at Nationals Park. But George Washington would have none of it. As the Nationals Park crowd watched Tom and Abe jostle for position, the father of our country high-stepped his way past them both to take his first presidents race win of the long homestand. Teddy trailed the pack, and barring a major upset this weekend, appears to be headed for the All Star break winless for the fourth time in as many years.